On average, victims commonly leave and return to their abuser seven times before leaving the relationship permanently. 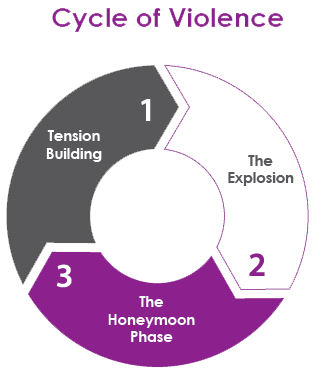 While the length of time may vary between the phases of the cycle, the intensity almost always worsens each time. This is when the abuser begins to get angry and the victim may feel as though they are "walking on egg shells". This is also the time when the abuser begins to isolate the victim from their support system, tension rises and anxiety and fear begin. This is the time when the abuse takes place, and the "incident" actually occurs. This is when the couple often reconciles because the abuser apologizes or makes promises to change. They may go to great lengths to show their remorse such as sending flowers or planning a special surprise.